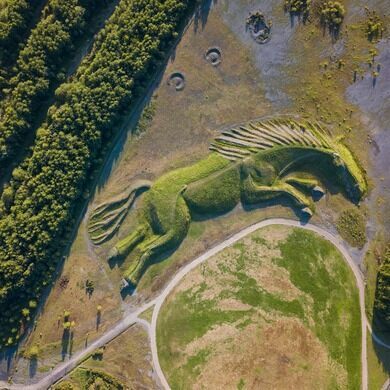 The enormous earthwork sculpture honors the ponies that lived and worked in the old colliery. 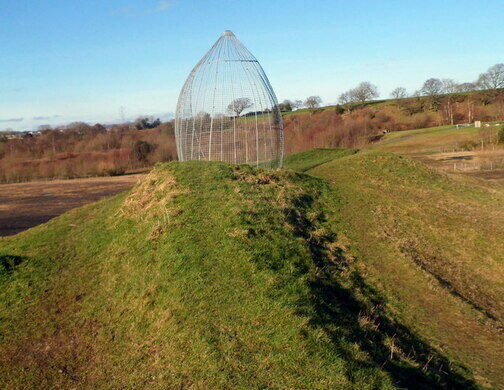 From the ground, this massive sculpture looks like a strange set of lumpy hills. Take to the skies, however, and you’ll see it forms the shape of a pot-bellied pony, its legs outstretched as it gallops gleefully over the land. It’s said to honor Sultan, a beloved pit pony that once worked in the old colliery. This neolithic stone grave has been altered and restored so often its now more neo than lithic. “Pit ponies” were put to work in coal mines throughout the 18th through 20th centuries. In the United Kingdom, the hardy equines were first dispatched underground in 1750. They became more prominent in the 19th century after 26 children tragically drowned while working at the Huskar Colliery. Public outcry put an end to the then-common practice of sending women and children into the mines, and they were replaced by ponies and horses. The pit ponies lived mainly underground, working an average of eight hours a day and spending their nights in their subterranean stables. They lugged tubs of coal throughout the dark, deep mines, only coming to the surface for the occasional colliery holiday. By 1913, there were 70,000 pit ponies in the U.K. alone (the United States typically favored donkeys and mules). They were highly valuable to the mining companies and, as such, often received better care and stricter regulation than the human workers. But by the end of the 20th century, modern technology rendered these equine workers obsolete. Great Britain’s last pit pony went above ground in 1999. 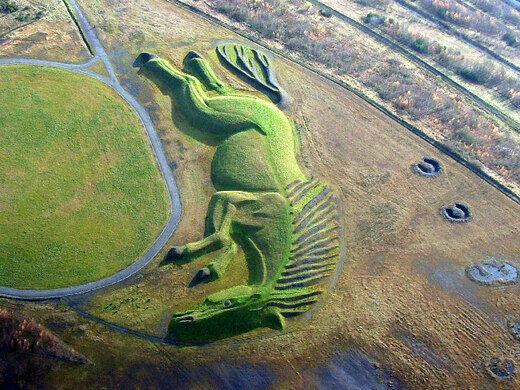 Parc Penallta, which sits on the site of the old Penallta Colliery, honors the mine’s nonhuman workers with Sultan the Pit Pony, which is one of the largest figurative earthwork sculptures in the U.K. The enormous equine was created by Welsh artist Mick Petts, who used 60,000 tons of coal shale, dirt, and stone to construct the 656-foot-long (200-meter-long) artwork. The pony was originally unnamed, but it wasn’t long before locals named him after Sultan. The sculpture was built for a practical reason—it was meant to act as a windbreak to protect the park from strong winds—but the pony serves a recreational purpose, too. Various trails let park visitors crisscross the pony’s entire body. You can even walk to its eye, which is formed by a conical structure erected atop Sultan’s verdant face. The pony is best viewed from the air. If you're willing to settle for a from-the-ground view, you can visit Parc Penallta from 7:00 a.m. to 7:00 p.m.
A memorial to the British politician who spearheaded the National Health Service. England's only square-dimension hill horse was built to celebrate Queen Victoria's coronation. One English town's celebratory landmark spurred more trouble than anticipated.